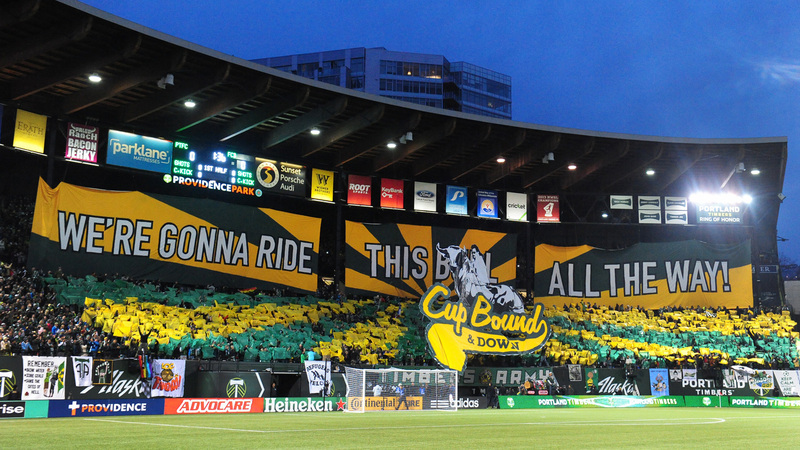 Portland Timbers fans unveiled a massive tifo before Sunday's rivalry game against the Seattle Sounders. 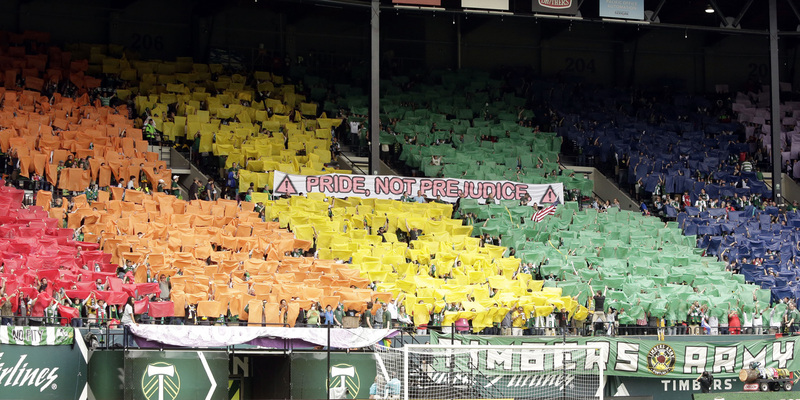 The Portland Timbers-Seattle Sounders rivalry is the fiercest in MLS and Portland fans prepared for Sunday's edition of the derby by unveiling an impressive tifo. Portland went on to dominate the match, winning 4–1 behind goals from Darlington Nagbe, Rodney Wallace and two from Fanendo Adi. The game was the first meeting between the two teams since their heated U.S. Open Cup match that saw three Sounders get sent off, Clint Dempsey rip a referee's notebook and the Timbers eliminate the defending champions. 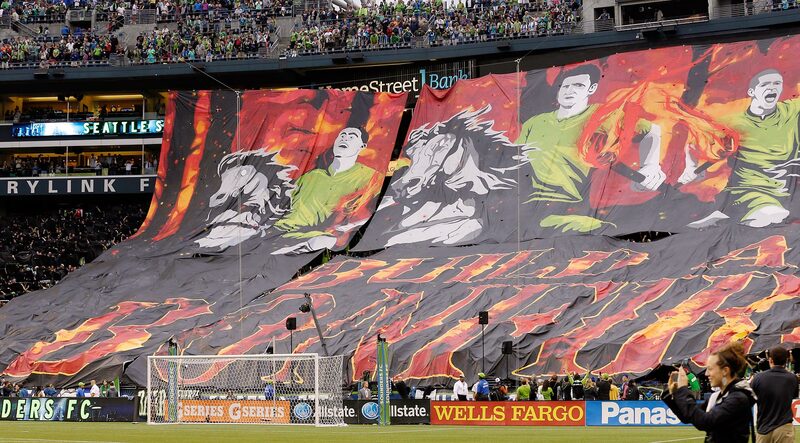 When you play a rival like Seattle Sounders FC, you have to bring the right tifo. 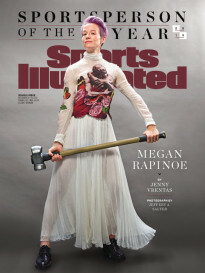 The Timbers Army certainly knows that, eh? 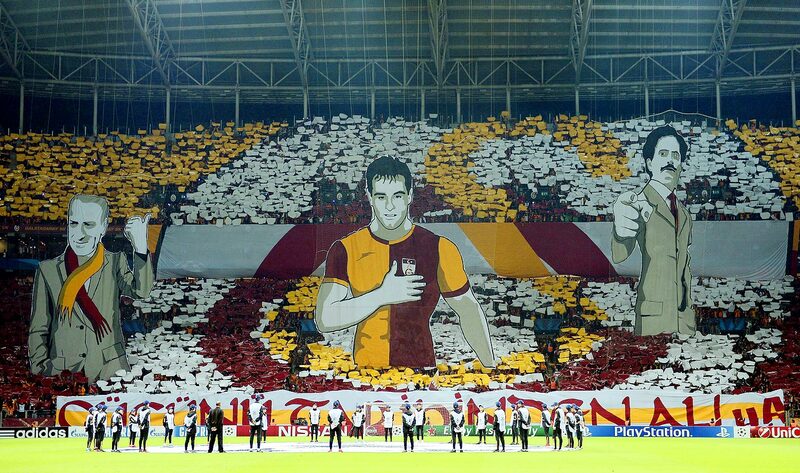 Galatasaray fans display a sensational "Rocky" tifo ahead of their clash against rival Fenerbahce. 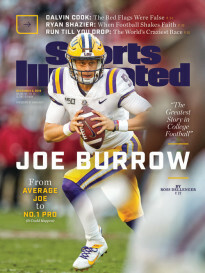 It didn't inspire a victory, though. The Turkish rivals played to a 0-0 draw. Borussia Dortmund fans channel their 1963 cup triumph over Benfica ahead of the teams' second leg in the Champions League round of 16 at Signal Iduna Park. 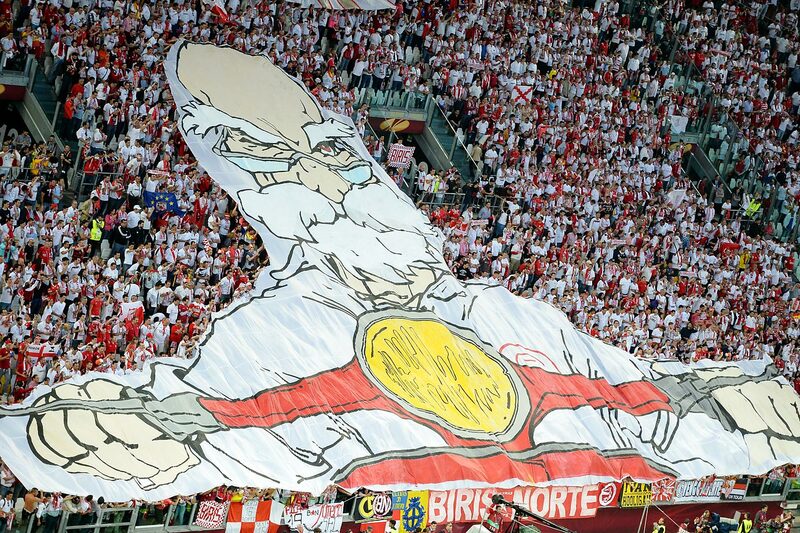 Hapoel Be'er Sheva fans turn to Moses for tifo inspiration, with his splitting the Red Sea illustrating how "impossible is nothing" in their Europa League series against Besiktas. 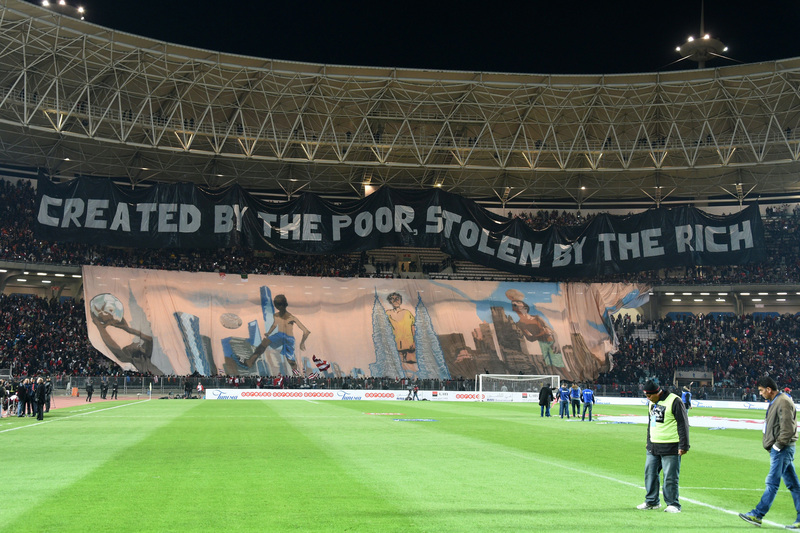 Fans of Tunisia's Club Africain display this pointed tifo at a friendly against PSG, whose Qatari owners have pumped millions and millions into the club. 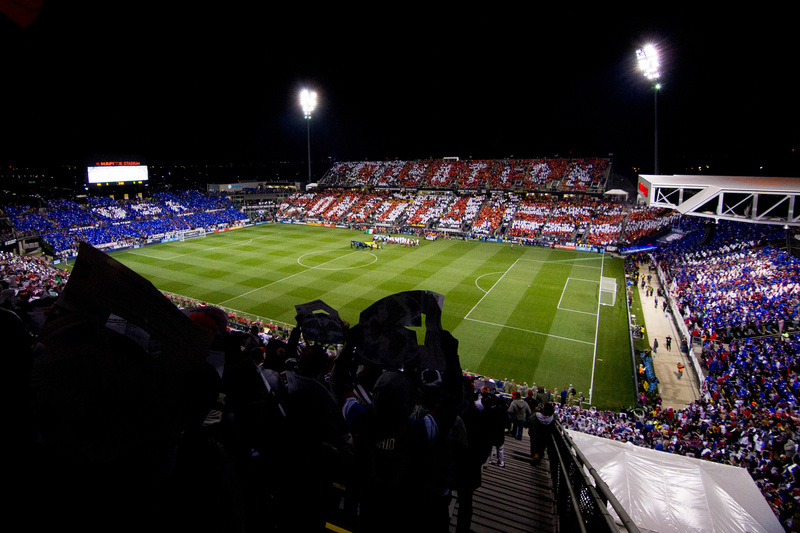 U.S. fans in Columbus, Ohio, make a "One Nation, One Team" statement ahead of the USMNT's World Cup qualifying match against Mexico on November 11, 2016. Germany fans display their heart for the team colors ahead of a World Cup qualifier against Czech Republic in October 2016. Italy fans spell out their support for the Azzurri ahead of a massive World Cup qualifier vs. Spain in October 2018. Iceland fans keep up their world-famous passion for the national team during a World Cup qualifier against Turkey in October 2016. Fans in the United Arab Emirates set their sights on reaching the 2018 World Cup in Russia during a qualifying match vs. Australia in September 2016. Colombia fans send a massive jersey around the stadium during a World Cup qualifier vs. Venezuela in September 2016. Seattle Sounders fans turn to Game Of Thrones for inspiration in a game against the Cascadia rival Vancouver Whitecaps in September 2016. 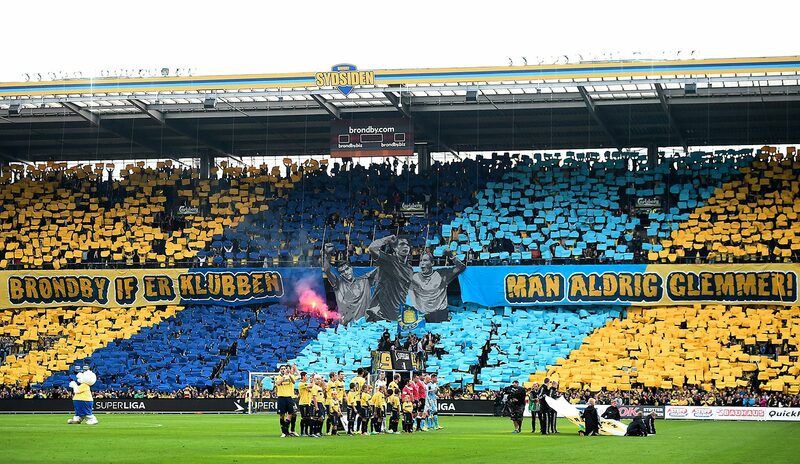 Djurgardens fans go all out in Sweden for a match against AIK in September 2016. Zulte Waregem fans prepare Kortrijk for the absolute worst in this Belgian top-flight match in September 2016. Seattle Sounders fans turn their pop culture reference to Poltergeist in March 2016 ahead of the season home opener against Sporting Kansas City. The Timbers Army doubles down on their Eastbound and Down theme, adding another wrinkle during the club's MLS Western Conference final first leg vs. FC Dallas on November 22, 2015 at Providence Park. 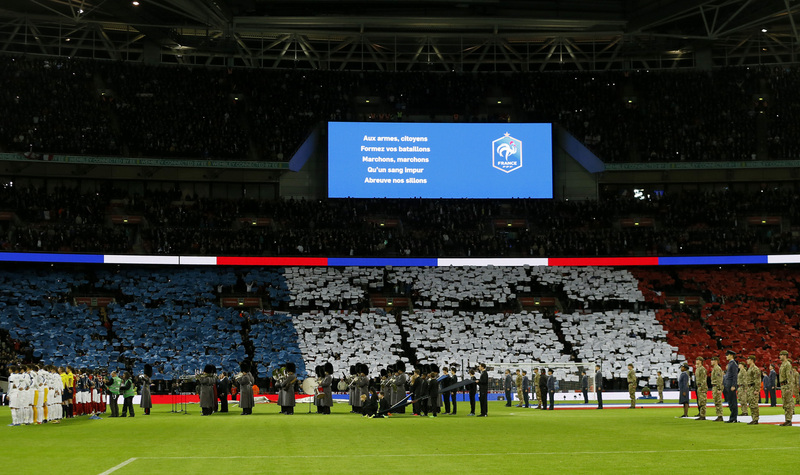 Fans make a French flag tifo at Wembley Stadium during the singing of Le Marseillaise ahead of England's friendly vs. France, which took place days after the terrorist attacks in Paris. 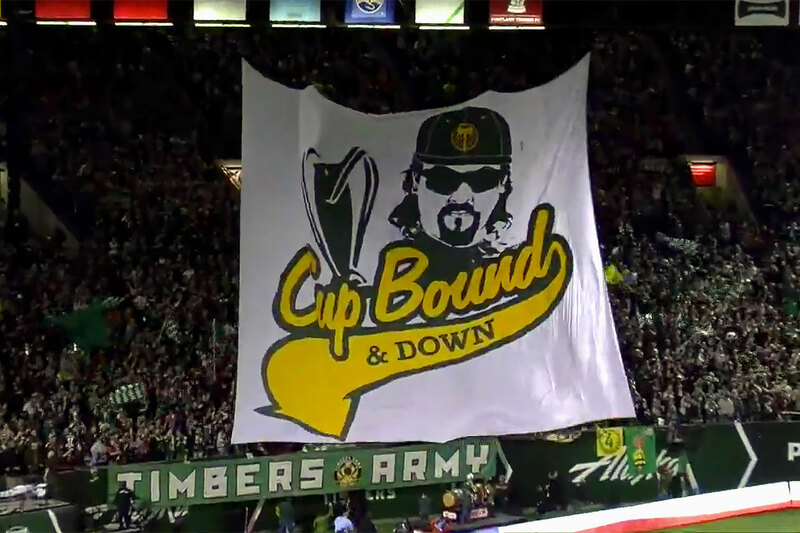 The Timbers Army referenced Eastbound & Down's Kenny Powers with their "Cup Bound and Down" tifo for the Portland Timbers' MLS playoff elimination game against Sporting Kansas City on October 29, 2015. 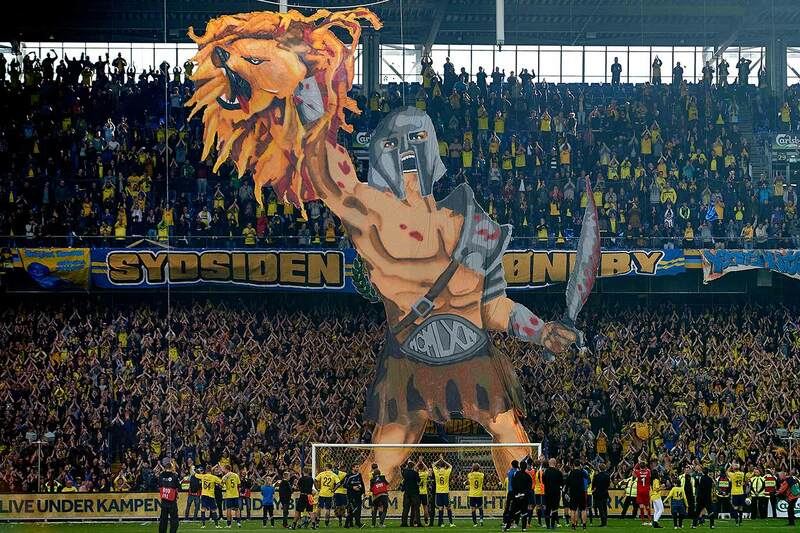 Brondby IF fans display a gladiator holding up a lion's head during the team's Danish Alka Superliga match against FC Copenhagen, whose logo is a lion's head, on September 27, 2015. 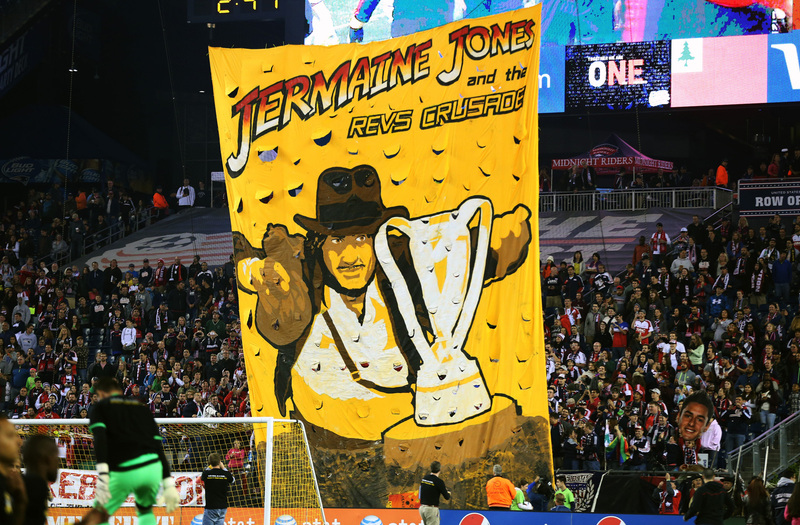 New England Revolution fans equate Jermaine Jones to Indiana Jones on their quest to capture the 2015 MLS Cup on September 26, 2015. 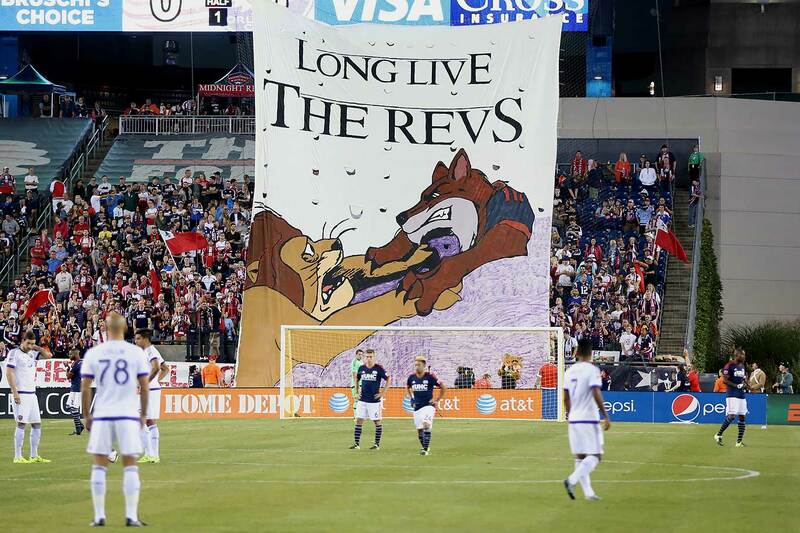 New England Revolution fans display a Lion King theme in honor of Orlando City FC's first visit to Gillette Stadium on September 5, 2015. 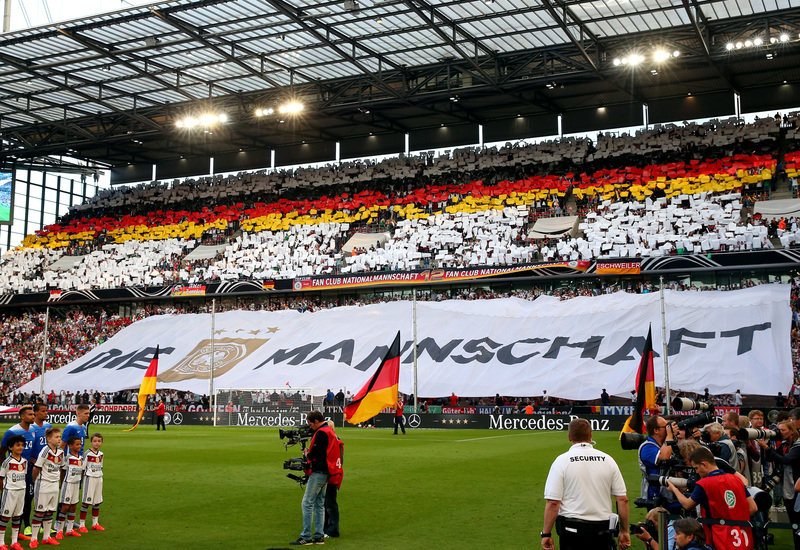 Germany fans in Cologne salute their World Cup champions ahead of a friendly against the United States in June, 2015. 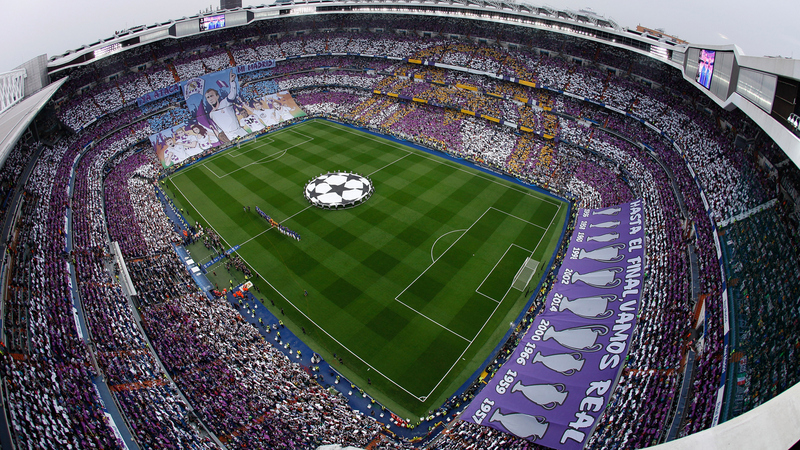 Real Madrid fans went all out prior to the second leg of the 2014-15 Champions League semifinal vs. Juventus. 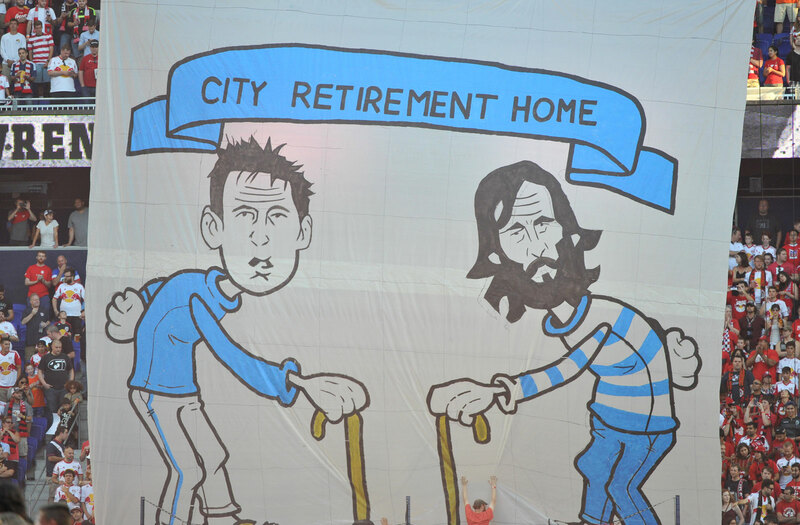 Lazio fans display a stunning eagle tifo ahead of the Rome derby against AS Roma in their penultimate Serie A match of the 2014-15 season. 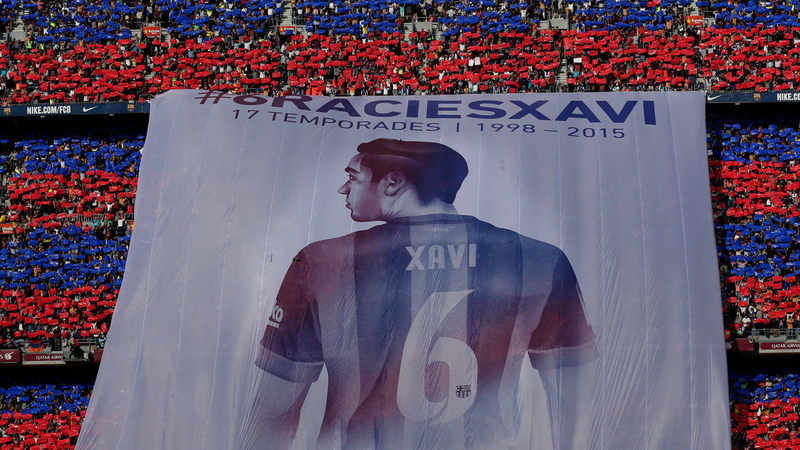 Barcelona fans bid farewell to veteran midfielder Xavi with this banner at his last league game at Camp Nou before he departs for Qatari club Al Sadd. 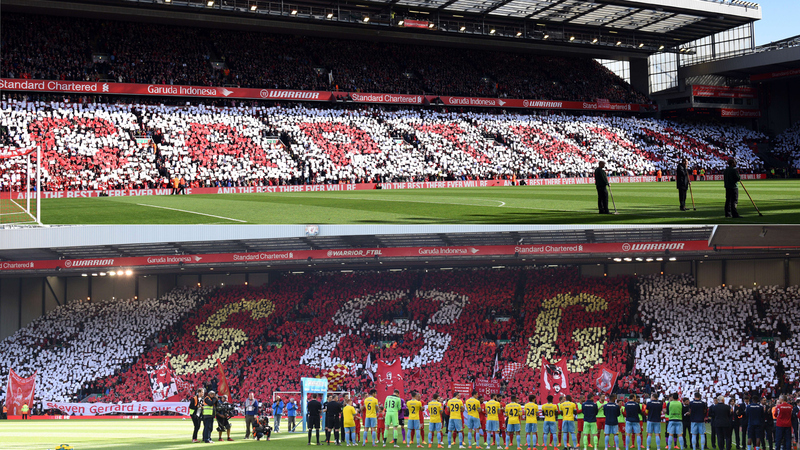 Fans at Anfield pay tribute to Steven Gerrard in his final home match as a Liverpool player in May 2015. 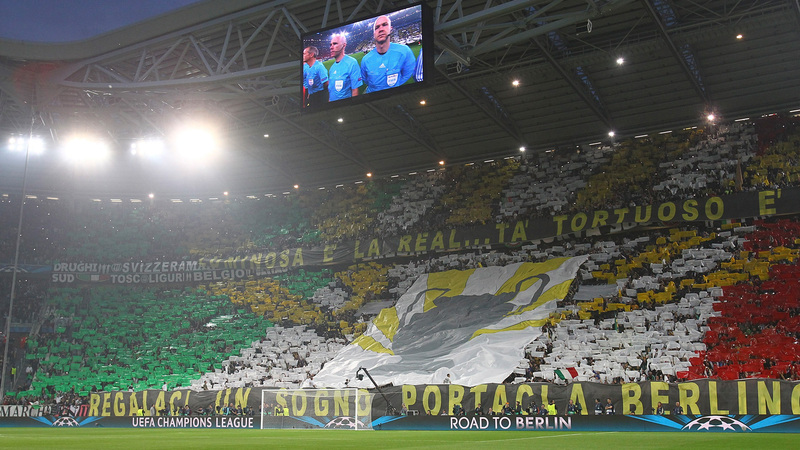 Juventus fans state their case to beat Real Madrid in the 2014-15 Champions League semifinals and reach the final in Berlin. 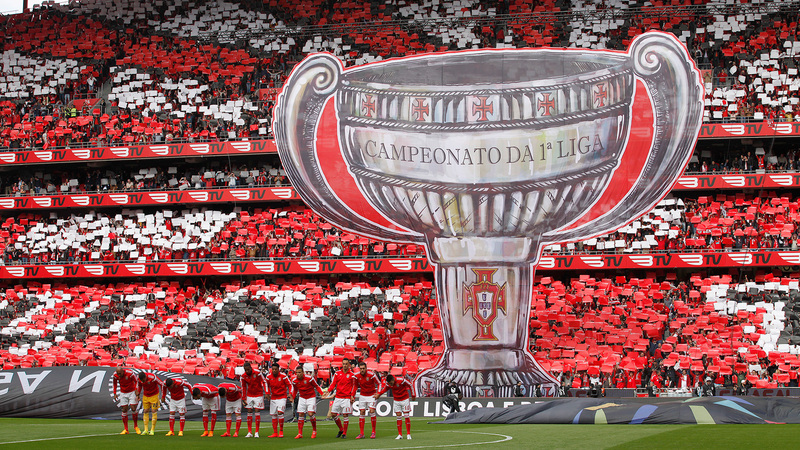 Fans at Benfica's Estadio da Luz remind rival Porto who the Primeira Liga reigning champion is during an April 2015 match in Portugal. 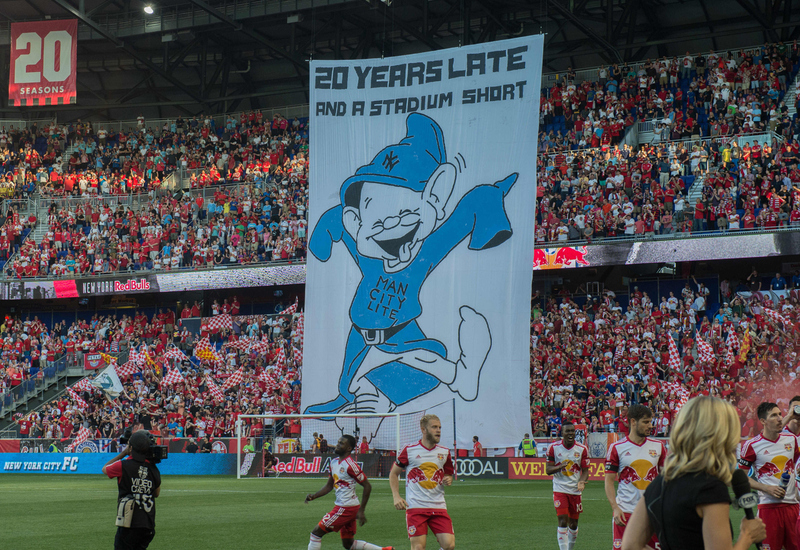 New York Red Bulls fans send a pointed message to their NYCFC counterparts prior to the teams' first MLS meeting in May, 2015. 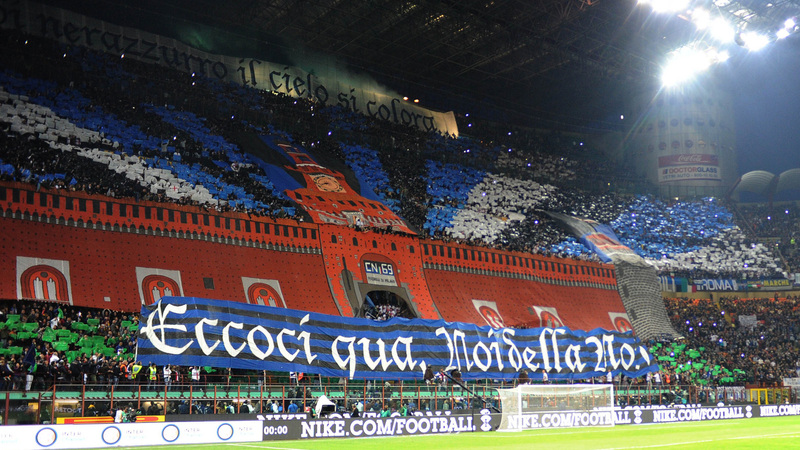 Inter Milan's Curva Nord announces its presence ahead of the April 2015 Derby della Madonnina–the annual clashes between city rivals Inter and AC Milan. 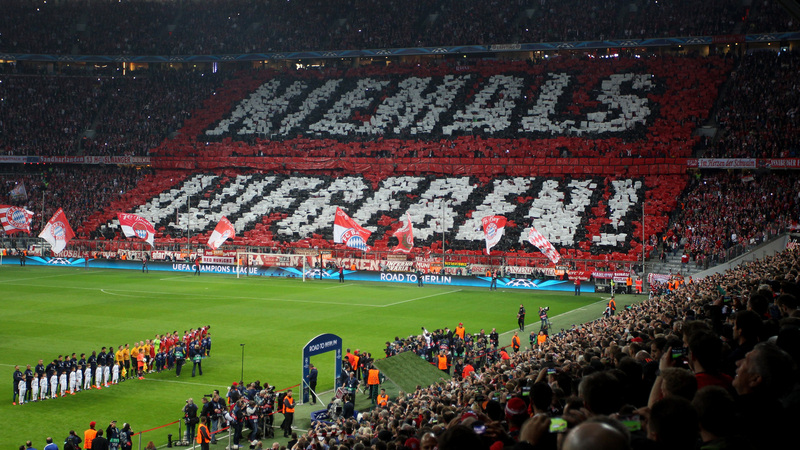 Bayern Munich fans implore their club to (translated) "Never give up" in the Champions League quarterfinal second leg vs. Porto. Bayern then turned a 3-1 first-leg deficit into a 7-4 aggregate win and a place in the semifinals. 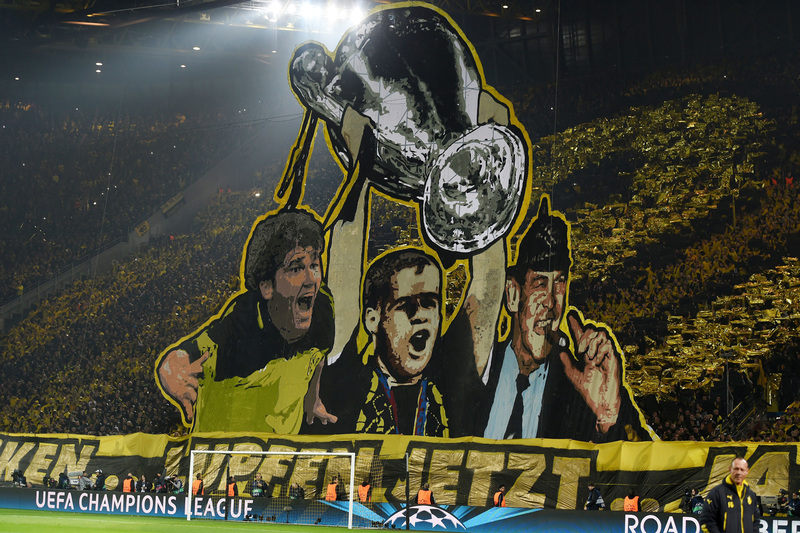 Dortmund fans commemorate their 1997 Champions League trophy in the club's clash vs. Juventus–the opponent on the wrong side of that title bout. 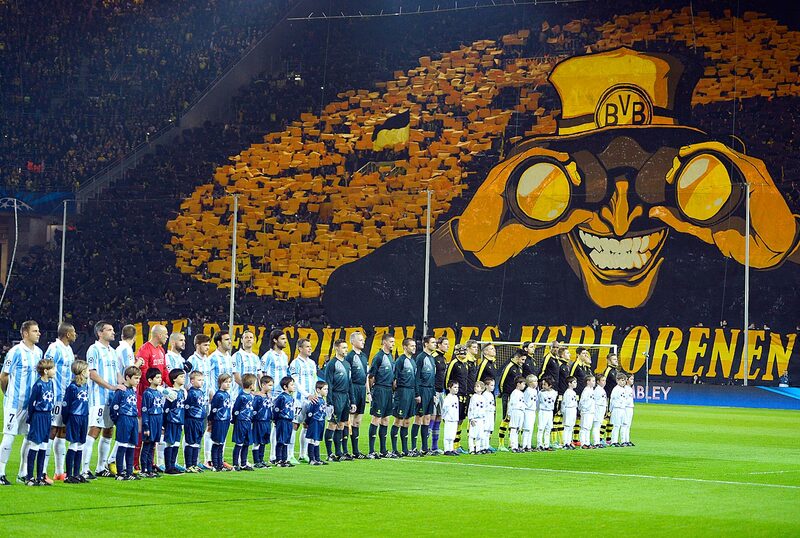 Borussia Dortmund fans put on a remarkable display ahead of a UEFA Champions League quarterfinal second leg match. 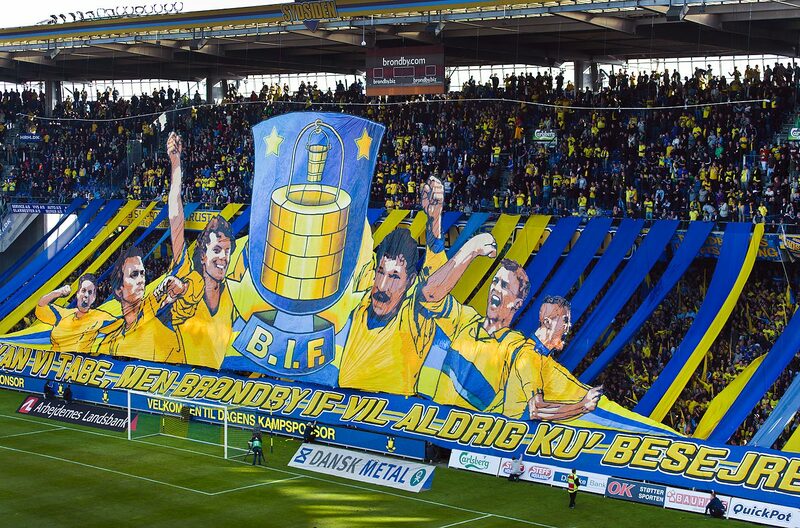 Brondby IF fans unveil a tifo ahead of a match in Denmark against Randers FC. 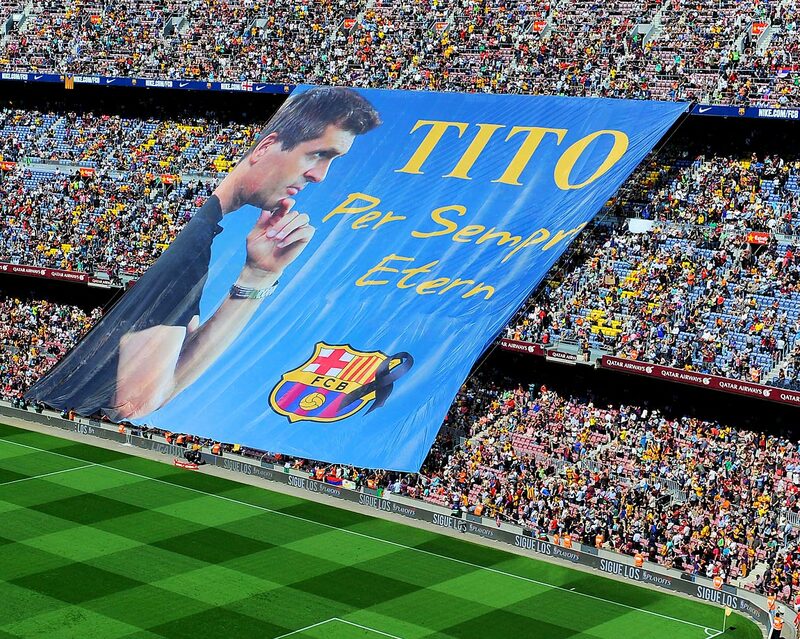 FC Barcelona fans display a huge banner in memory of former head coach Tito Vilanova. Galatasaray fans support their team during the UEFA Champions League Group D match between Borussia Dortmund and Galatasaray at the Turk Telekom Arena in Istanbul. 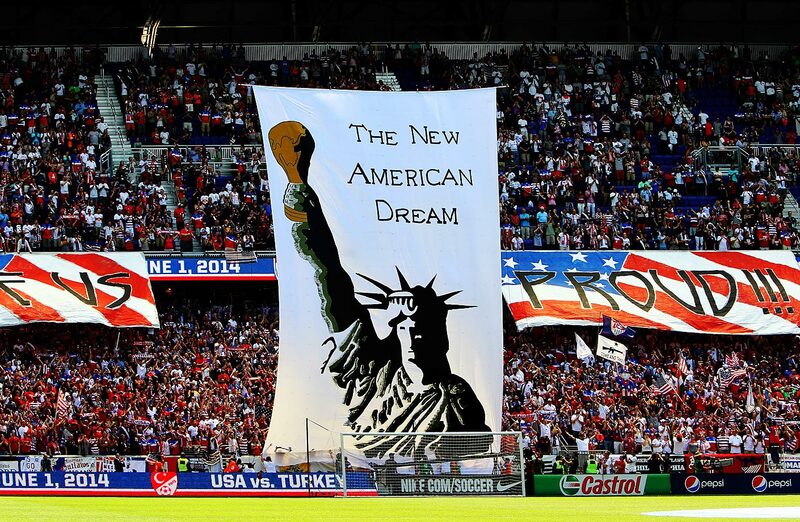 The American Outlaws unveil a huge tifo ahead of a 2014 World Cup send-off match between the USA and Turkey at Red Bull Arena in Harrison, N.J.
Marseille's supporters use paper sheets to create an "OM" (Olympique de Marseille) tifo at the beginning of the French L1 football match between Marseille and Genoble. 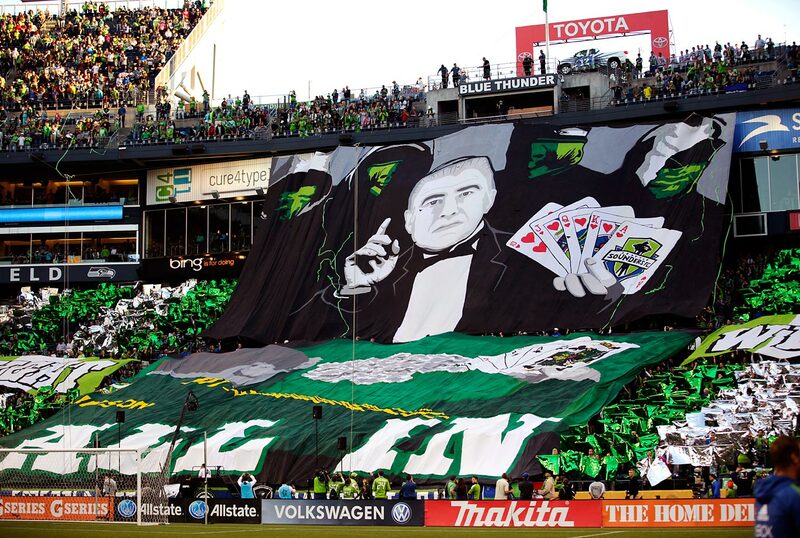 Seattle Sounders fans display their tifo that shows coach Sigi Schmid playing cards and holding a Royal Flush before a match against the Portland Timbers. 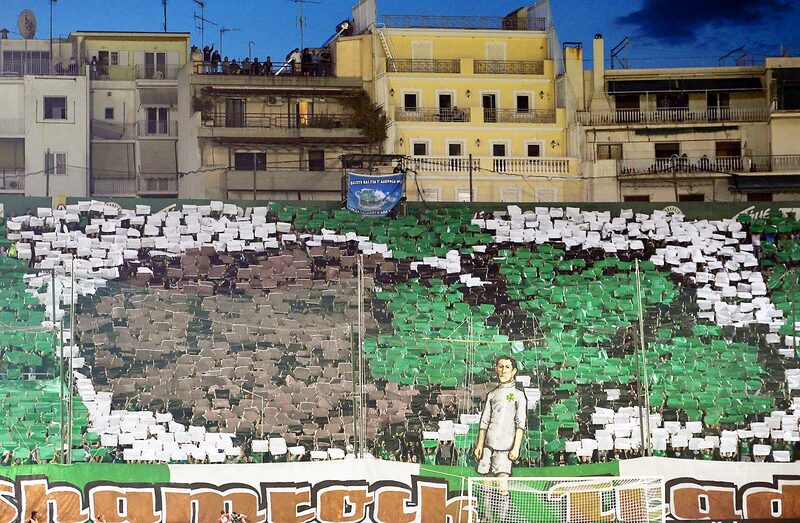 Panathinaikos Athens fans display a banner during the UEFA Europa League match against Dynamo Moscow. 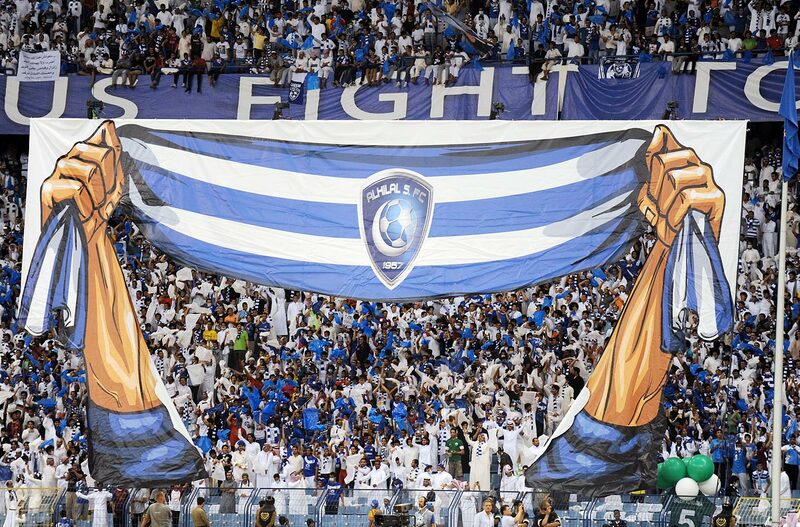 Fans of the Saudi Al-Hilal team celebrate after the scoring of a goal against Uzbekistan's Bunyodkor. Seattle Sounders fans unveil a tifo inspired from the “Build a Bonfire” chant, featuring Sounder players holding torches on horseback ahead of a game against the Portland Timbers. 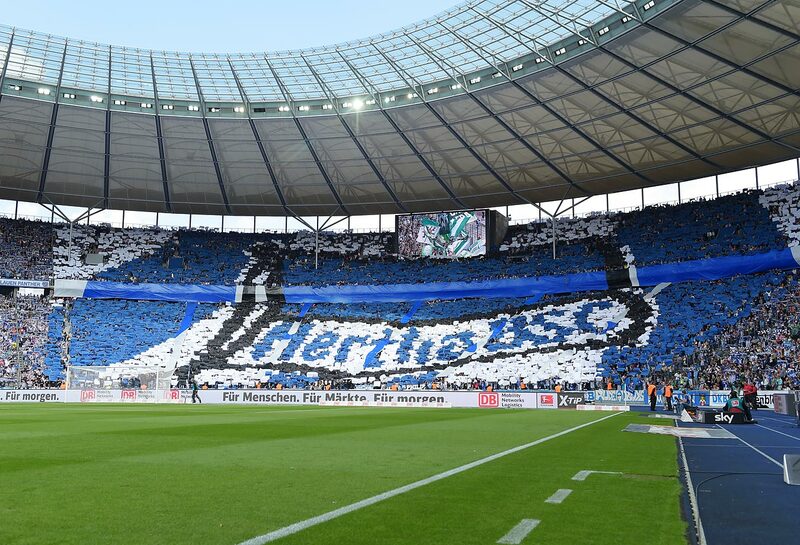 Fans of Hertha BSC before the Bundesliga match between Hertha BSC and Werder Bremen in Berlin. 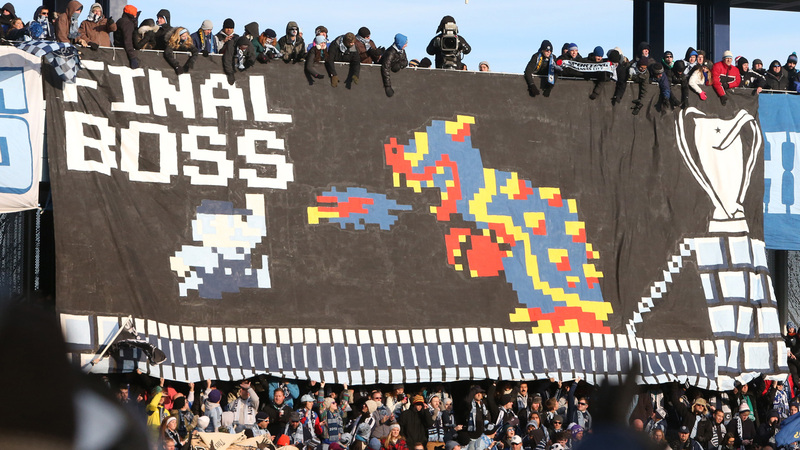 Sporting Kansas City fans channel their inner Mario ahead of the 2013 MLS Cup final vs. Real Salt Lake. 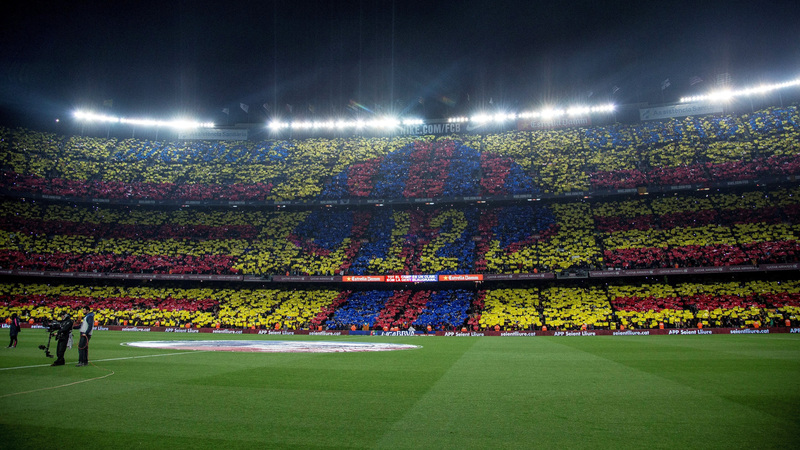 Thousands of Barcelona fans hold up cards to spell out "Barca! 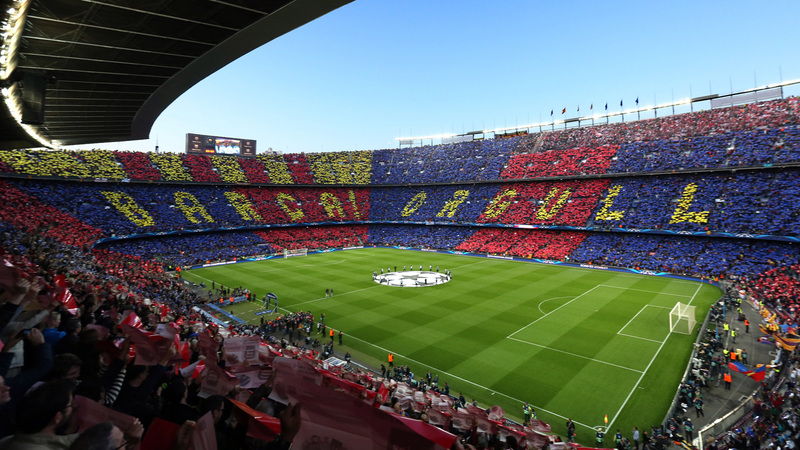 Orgull," which translates to "Barcelona pride" ahead of a Champions League clash with Bayern Munich at Camp Nou. 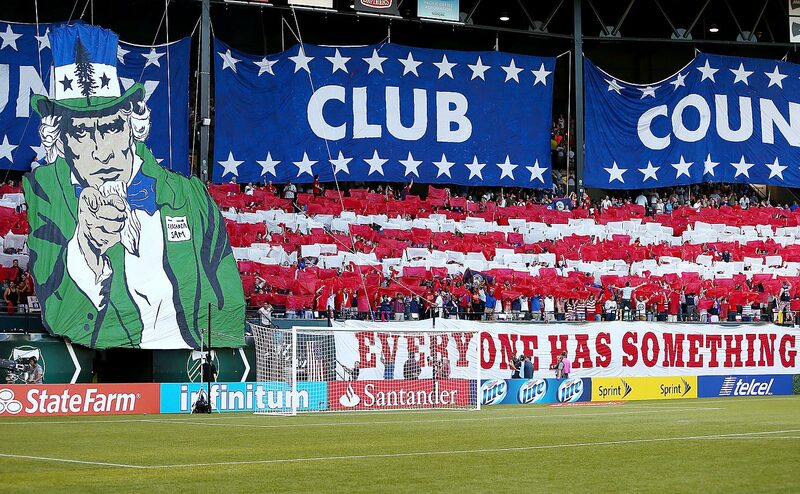 Fans raise a tifo celebrating “Community, Club and Country” ahead of a CONCACAF Gold Cup match between the USA and Belize in Portland, Oregon. 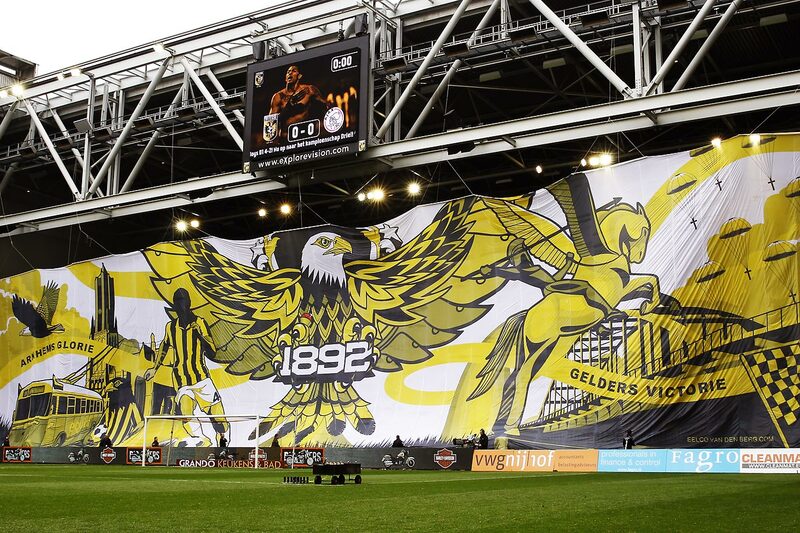 Vitesse fans unfurl a massive Eagle banner at the Dutch Eredivisie match against Ajax at the GelreDome. 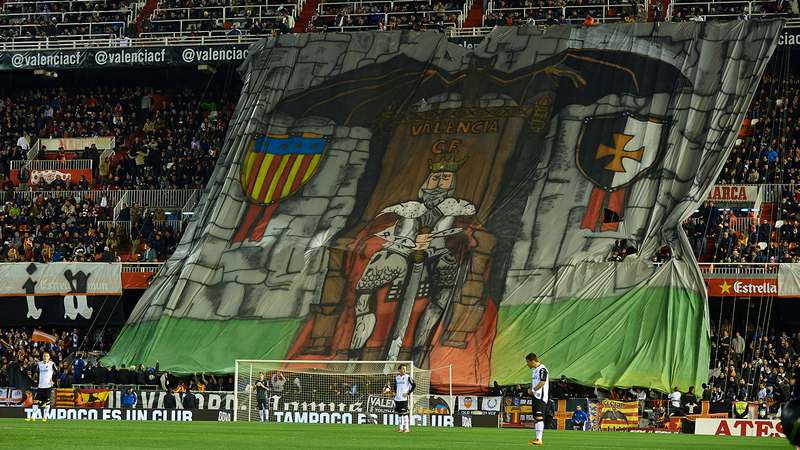 Valencia fans drape a banner featuring a king for a Copa del Rey ("The King's Cup) match against Atletico Madrid. 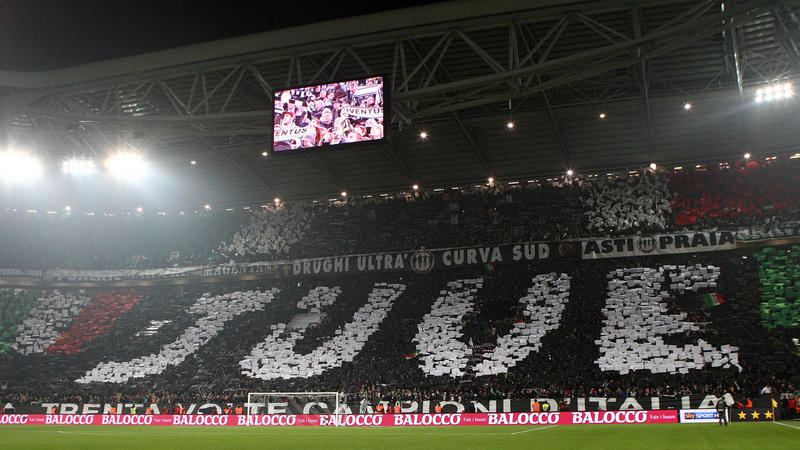 Juventus fans make a statement in Turin in a match vs. Inter Milan. 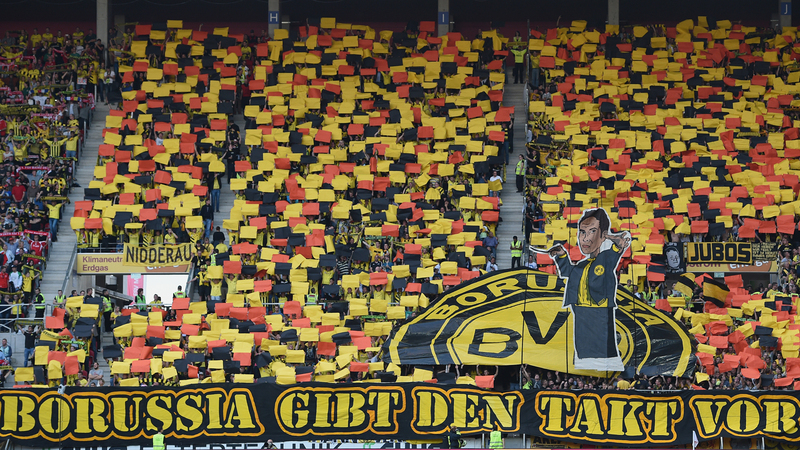 Dortmund fans put on another strong display at a Bundesliga match against Mainz 05. 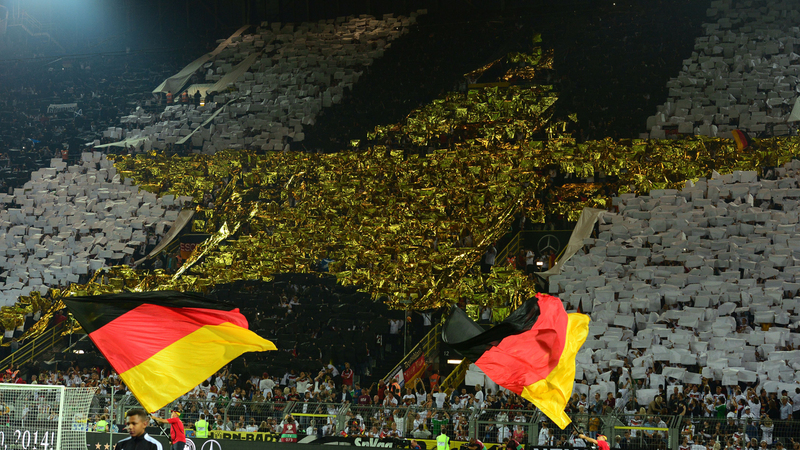 German fans boast the newest star earned by the national team, symbolizing its 2014 World Cup triumph, at a Euro 2016 qualifying match in Dortmund. 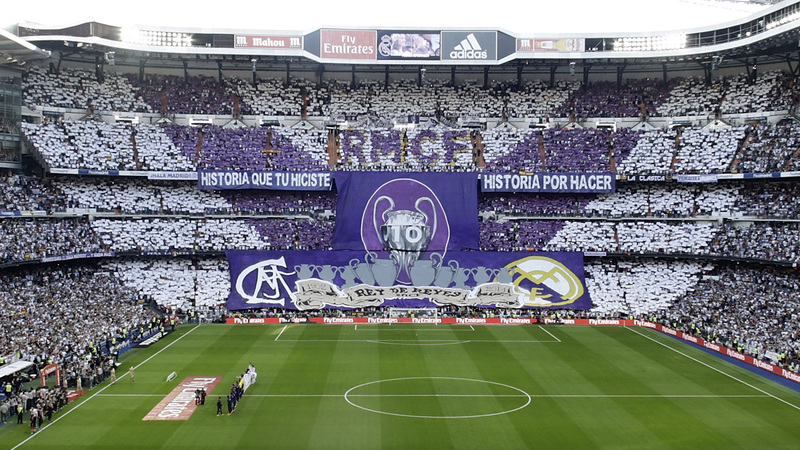 Real Madrid fans make a point to display the club's 10 European championships ahead of the October 2014 clash against rival Barcelona at the Bernabeu. 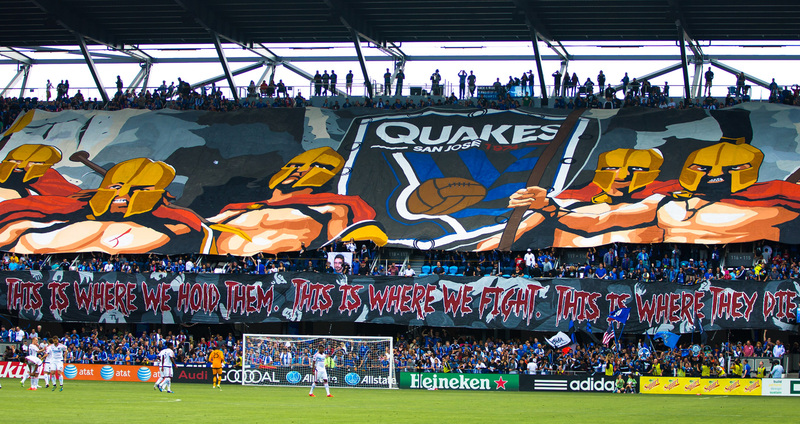 San Jose Earthquakes fans unleash a massive tifo to mark the opening of Avaya Stadium, MLS's newest soccer-specific venue, in March 2015. 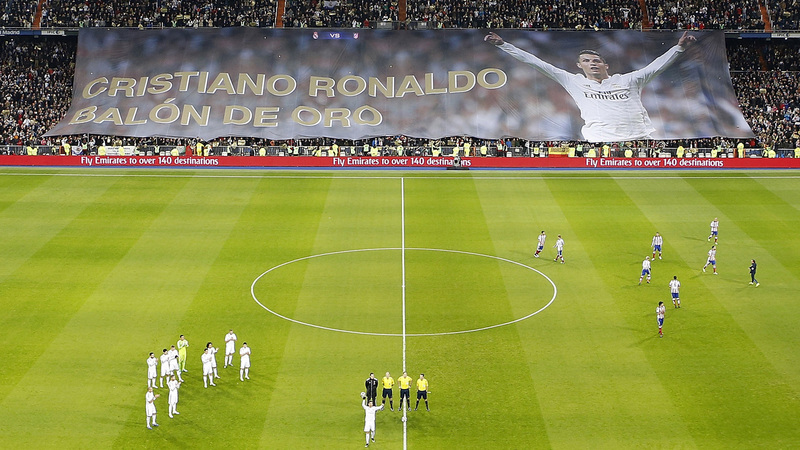 Barcelona fans show all who the real 12th man is ahead of the March 2015 Clásico vs. Real Madrid. 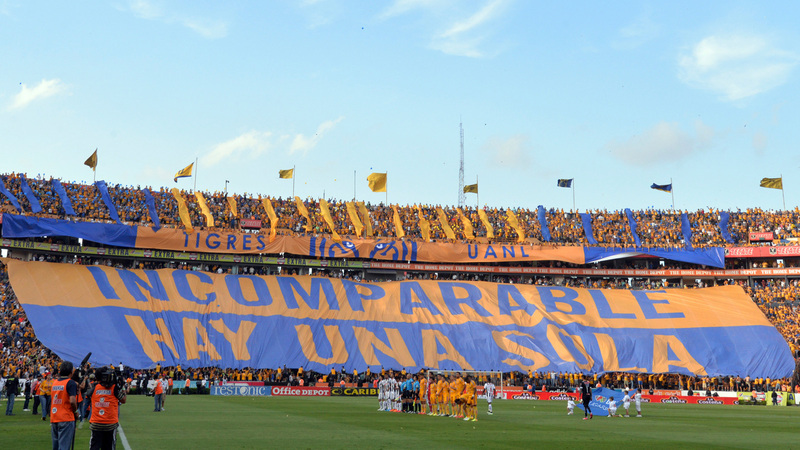 Ahead of a clash with Mexican foe Monterrey, Tigres players are treated by this message by its fervent supporters. 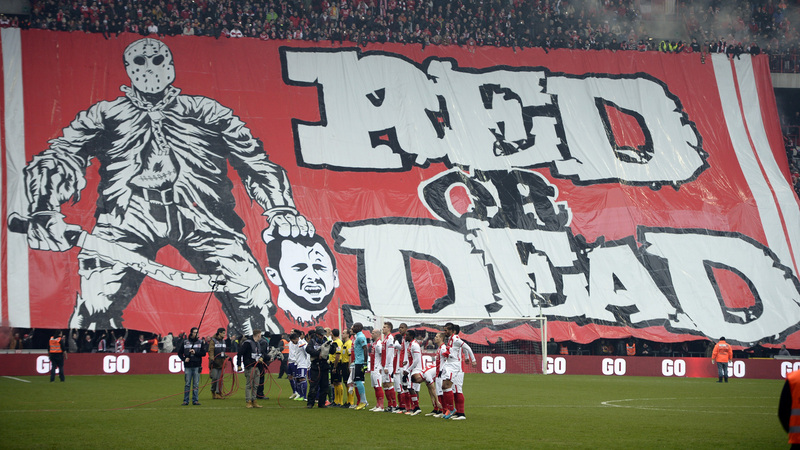 Standard Liege fans have a pointed message for Steven Defour, who departed the club for Belgian rival Anderlecht. 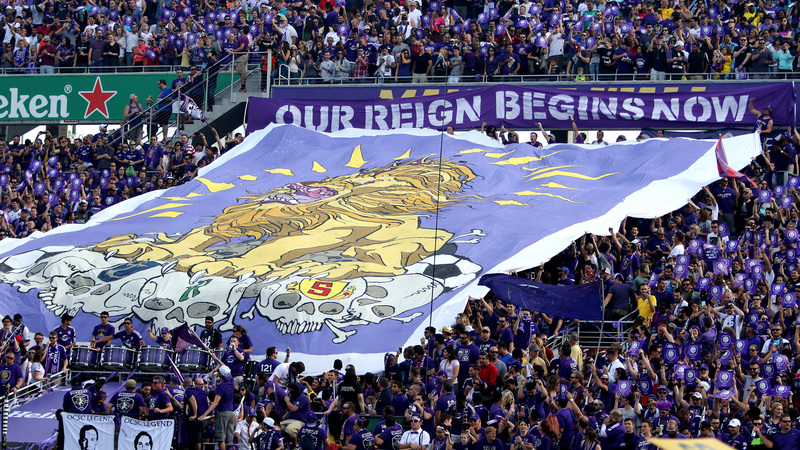 Orlando City fans mark their club's inaugural MLS game vs. fellow expansion side New York City FC with a statement that the Lions' "reign begins now." Real Madrid fans salute Ballon d'Or winner Cristiano Ronaldo after he captured the most prestigious individual prize in world soccer again. 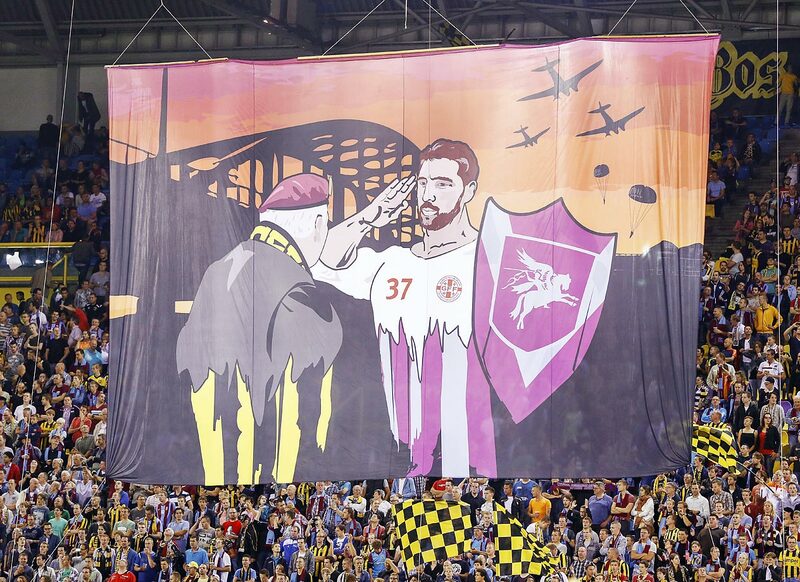 Vitesse fans pay homage to Operation Market Garden ahead of an Eredivisie match against SC Heerenveen. 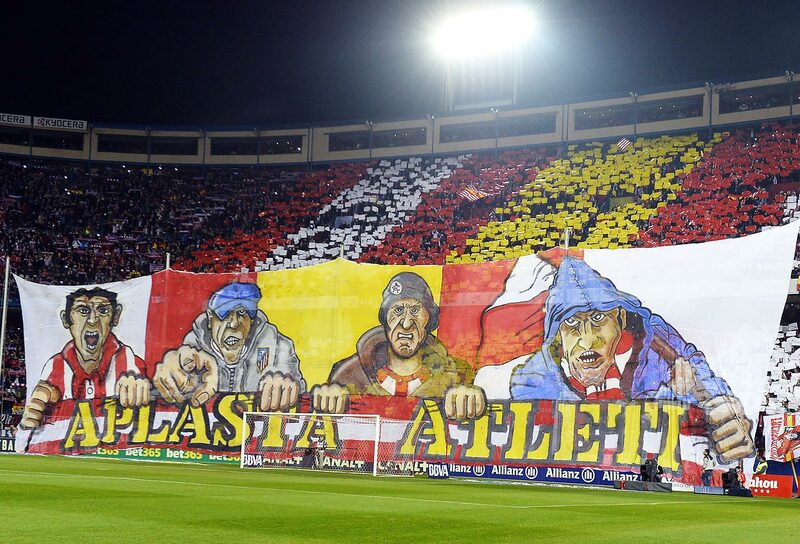 Sevilla's fans deploy a giant banner in the stands before the UEFA Europa league final match between Benfica and Sevilla. 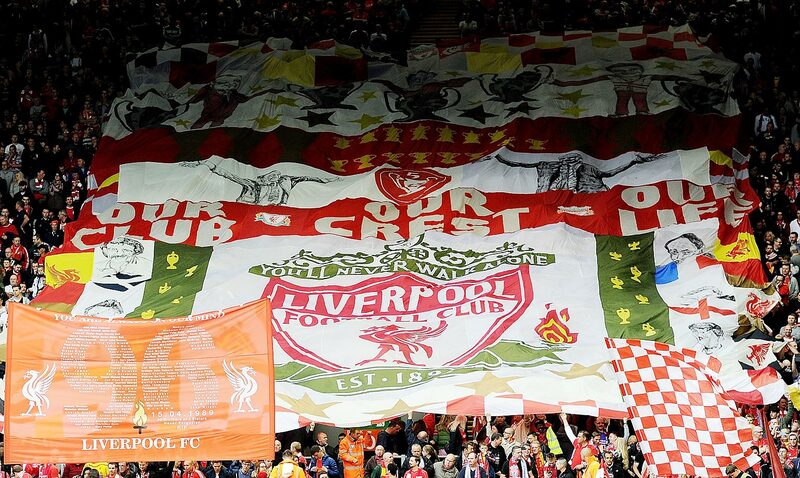 Fans in Liverpool’s Kop End at Anfield commemorate those lost in the Hillsborough disaster. 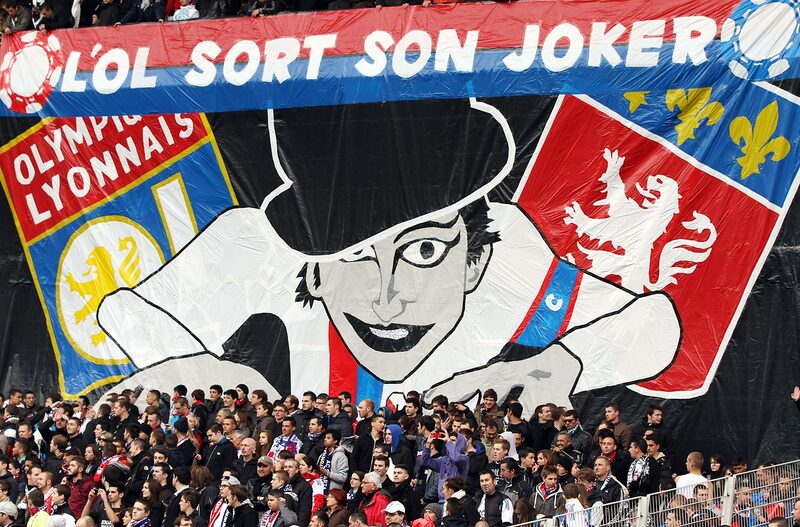 Lyon fans during a game against Saint Etienne.